Introducing a bit of ‘soft adventure’ into a relaxing beach holiday can seem like a bit of a headache – where should we go? How would we get there? What will we need to pack? Which activities shall we pre-book? I was looking for a relaxing beach break, so it felt like Thailand ticked all the boxes. However, although 10 days on the beach sounds great in theory, I knew I needed a bit more to make this trip really memorable. As I was travelling alone and short on time, a visit to Elephant Hills was the clear choice. Their luxury tented safari package is packed full of fun and interesting activities and only a few hours from Phuket. Sign me up! Located in Khao Sok National Park, Elephant Hills Resort is Thailand’s first luxury tented camp, offering 2-4 day luxury adventures amidst the jungle and lake setting. Their most popular tour package which is suited to travellers of any age is the Jungle Lake safari. With this trip you spend one night at the Elephant Camp to enjoy an ethical elephant experience up close before transferring to the Rainforest Camp to sleep over in a tent floating on the lake. The highlight of any stay is an ethical elephant experience, which brings you up close to the amazing Asian elephants, with time for you to watch, feed and wash them – an incredibly memorable experience. Besides the elephants you can swim in the pool or lake, take a guided kayak tour or jungle trek, enjoy the evening activities which can include a cooking demonstration or a local dance performance, take your own private kayak out on the lake, or simply relax and enjoy your surroundings. You’ll soon realise that these guys know what they’re doing and everything runs like a well-oiled machine! They arrange transport from Phuket, Surat Thani, Krabi, Khao Lak, and even as far as Koh Samui. This is such a benefit, making it easy to fit Elephant Hills into your trip without having to add pre/post nights in a nearby area. A great way to maximise the transport they offer is to fly into Phuket and spend some time on the beaches, then head to Elephant Hills before shooting down to Koh Samui. You can then fly on from Koh Samui and you’ve managed to hit three great areas in Thailand with minimal effort. All you have to do is let them know where you are staying, and the rest is taken care of and included in the price of your stay. This resort offer various itineraries to choose from and I decided to go for the 3 day, 2 night Elephant Hills Jungle Lake Safari as I was short on time and wanted to experience both sides of their tours. The Elephant Hills camp is their HQ and is situated in the rainforest right beside the river. I highly recommend taking time to use the swimming pool here – absolutely stunning scenery and a really awesome experience. This camp is the base from which you can visit the elephants. 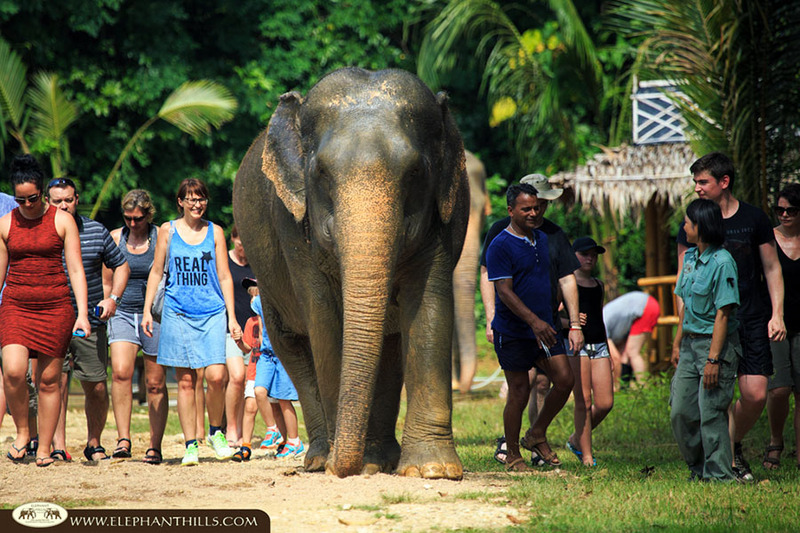 You can watch them frolic in a big muddy pit before helping to hose them down and give them a good scrub with coconut husks – I never thought I would get so close to an elephant! You also get to prepare their lunch and feed them by hand… they seem to love pineapples! The other tour I really enjoyed here was the canoe trip. Floating down the river through the forest and limestone cliffs while avidly searching for reptiles and birds is a pretty great way to spend the afternoon. The second camp is the Rainforest Camp and it really is something very special. The appeal of the Rainforest Camp is its location and accommodation; set just off the shore, the floating tents are fantastic. Waking up and walking out of your tent, you’re greeted by the calm water surrounded by unspoilt rainforest – it’s truly idyllic, and jumping straight into the lake is something I will always remember. The journey to get there was actually one of my highlights of the trip; you travel by long-tail boat across the Cheow-Lan Lake, which has been largely overlooked by tourism so it’s maintained its charm. It reminded me of Halong Bay in Vietnam, as it has huge limestone cliffs shooting up out the water which are covered in lush green rainforest. The weather wasn’t great when I was at the Rainforest Camp, however that didn’t stop us from heading off for an amazing jungle trek or from exploring the twisted and intertwining waterways by kayak. You’re free to pick and choose how much you do or don’t do, and there were plenty of people who chose to sit on their porches and enjoy the peace and quiet this wonderful place provides. Why I loved this place! The great thing about Elephant Hills is that it offers a really laid back holiday experience, but the staff still manage to provide amazingly friendly and efficient service. I found it’s a great balance of being ‘taken care of’, but not being herded around all day. You get to sleep in a floating tent! Interested in adding an Elephant Hills jungle lake safari to your trip? If you’d like to add Elephant Hills into your Thailand itinerary, we can help plan a tailor-made holiday that suits you exactly. For help with flights and all of your trip ideas, call one of our consultants on +44 1273320580 or request a quote by email.